Black Jett is a very nice 3/4 Peruvian male with a gentle and playful personality. Jett exhibits a beautiful true black fleece with a soft handle, nice lustre and medium density. He has good fiber coverage and very straight conformation. 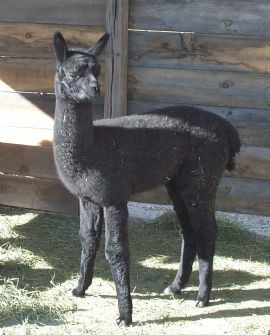 Black Jett's bloodline is very strong on color so we will anxiously await seeing what he produces when mature.